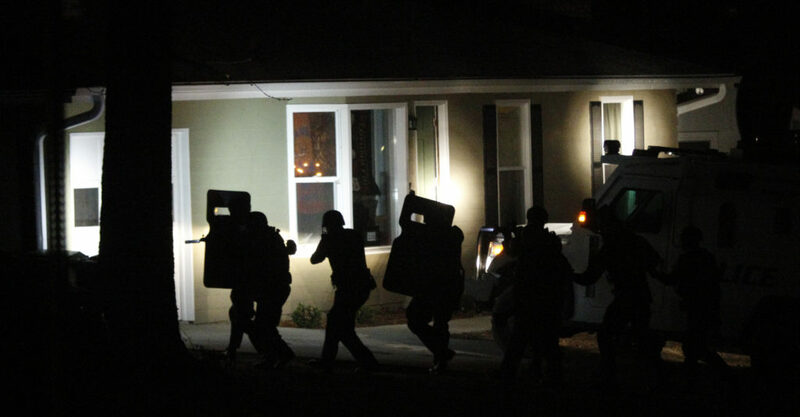 A SWAT team moves in on the house at 3009 Steven Drive early Friday morning, where Lawrence Police are investigating after a 27-year-old man was shot at least once near the address. No one was found after the SWAT team searched the house. Lawrence police have booked Dashawn C. Clayborn, 22, of Kansas City, Kan., into the Douglas County Jail in connection with a Lawrence shooting that left a 27-year-old man in critical condition Friday morning. 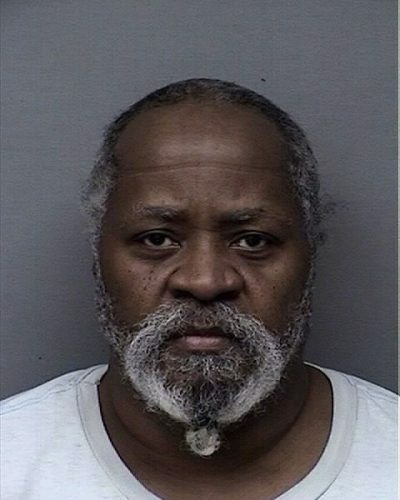 Shortly before 8 a.m., Clayborn was taken into custody after leading law enforcement officers on a high-speed chase on Kansas Highway 10 and crashing a stolen vehicle near Eudora. 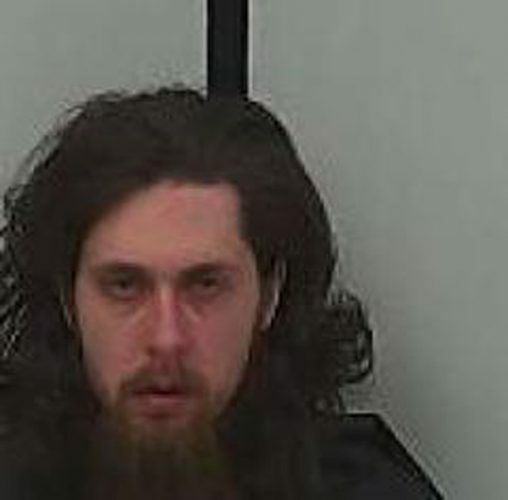 He was booked into the jail around 11 a.m. on suspicion of attempted first-degree murder, vehicle burglary, theft, fleeing law enforcement, reckless driving, driving while suspended and drug possession. Lawrence police were called to the 3000 block of Steven Drive shortly before 12:40 Friday morning. On arrival, officers located a man with a gunshot wound to the back and a second possible wound to the jaw. A Life Star helicopter was called to nearby West Middle School, 2700 Harvard Road, and the victim was transported in critical condition to Kansas University Hospital in Kansas City, Kan. As of 2:20 p.m., Lawrence Police Department spokesman Sgt. Trent McKinley said the man’s condition had improved and he would be going into surgery later Friday afternoon. Officers used a public address speaker in an attempt to contact any individuals in a home at 3009 Steven Drive, and an armored police vehicle arrived at the scene shortly before 2 a.m.
Police received a search warrant for the address around 3 a.m. and entered the home around 3:10, but no one was found inside. Clayborn, who was staying at the home, fled the area in a vehicle before emergency responders arrived, McKinley said. The suspect reportedly stole a running vehicle from the driveway of a home near 24th and Alabama streets around 7:40 a.m Friday, then fled from officers who attempted to stop the car on East 23rd Street. The ensuing chase reached speeds of approximately 100 mph before Clayborn lost control of his vehicle and crashed near the Church Street exit on K-10 at Eudora. He was transported to a local hospital with injuries that were not life-threatening. Early Friday morning, officers took at least three people to the Investigations and Training Center for interviews. Sean Patrick McCawley, 38, the home’s owner according to Douglas County property records, was listed on the Douglas County Jail’s inmate roster Friday. He was not on the roster Thursday. The Douglas County Jail booking log does not yet reflect McCawley’s booking, so it is not yet known on what charges he were arrested. The home was the subject of police activity Wednesday, as well. The jail booking log shows that 29-year-old Summer Lynn Wise and 47-year-old Darrin Wayne Housworth, both of Lawrence, were arrested at 3009 Steven Dr. around noon Wednesday. Wise, who was arrested on suspicion of failing to appear at municipal court was released Thursday afternoon after posting a $210 bond. Housworth, who was arrested on suspicion of drug distribution and failure to appear at municipal and district courts, remains in jail as of 2 p.m. Friday. Douglas County Sheriff’s Office spokesman Lt. Steve Lewis said he could not release the booking photo of Clayborn on Friday night. Operation 100 News and Journal-World reporter Caitlin Doornbos contributed to this report.